For most smokers, giving up cigarettes is tough. Many have turned to vaporizers because they simulate smoking without tobacco, tar, and carbon monoxide. The trouble is, they still contain nicotine and aren’t really designed to help you quit. But Smokio is a more thoughtful approach. Unlike basic vaporizers, Smokio is a smart vaping monitor that can empower you with data about your behavior. All the details about your habit are sent straight to your smartphone, where you set goals and watch your progress toward giving up nicotine all together. Founders Steve Anavi & Alexandre (Alex) Prot collaborated with Paris doctors who’ve been working on nicotine and tobacco usage for decades. They wanted to guide people to cut back by helping them visualize the benefits—including the significant savings. The Smokio app shows your savings adding up as you cut back. It shows how your health improves, too. 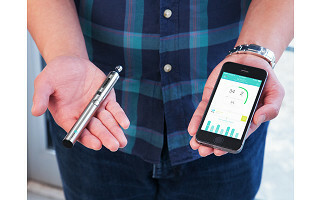 Each day, Smokio tracks the number of puffs taken and e-cigarettes smoked, and contrasts the total nicotine intake to that of regular cigarettes. Smokio also shows you the times and places you vape most often. For added support, connect to the Smokio community and even add sponsors to get encouragement. The decision to quit is still up to you, but Smokio is a modern way to get motivated. Thanks for coming to check out Smokio. We are excited to share and talk about this important topic. Please let us know if you have any questions. We think Smokio is a smart, courageous product. Designed to help smokers kick their nicotine habit, Smokio combines features of lifestyle monitors and technology wearables in an elegant, connected form with its smartphone app and the product itself. We know anything related to nicotine and tobacco is controversial so we sat down with Alex, the Maker, to learn more about Smokio. Hi Alex, what was the inspiration behind Smokio? Why did you make it? We wanted to come up with a product that would help people monitor how much they are vaping and how much nicotine they are inhaling. We had a lot of people around us saying how much they were using e-cigarettes and vaping without really knowing the effects. At the same time, there were so many wearables like Fitbit and Jawbone, so we thought why not give people a product that would help them track their intake in the same vein as those devices just with nicotine and cigarette usage. What makes Smokio different from an e-cigarette in terms of health concerns? The device itself is made up of the best material on the market. So it is a high-quality product. But beyond that, this is the first connected vaporizer. This connectivity does three things. One, it allows the user to track their usage directly on their phone. They can see how much they’ve been vaping, how many puffs, and how much nicotine they’re inhaling. Second, they can control their vaporizer from their phone. They can adjust the volume of the puff, set limits for the amount of nicotine per puff. They use their phone as a remote control for the device. Third, they have the coaching and social aspects of the app. Users can join teams, see how their teammates are doing and help each other achieve their goals. We’re offering the best of the e-cigarette market with the connectivity and functionality of the app. There are reports coming out about how easy it is for teenagers to purchase e-cigs online. Do you see that as a concern in selling Smokio? We’re only selling to people above 18. On our website, through other vendors, that is our sole goal is to sell to adults. There are teenagers buying things they shouldn’t be everywhere. But for this purpose, most teenagers have easier access buying standard cigarettes or e-cigarettes, not Smokio. The most likely consumer is a smoker who wants to switch to vaping or who already is vaping and wants the best or smartest vaping tool available, which is our product. They get the knowledge, through the app, of exactly what the vaping is doing. We want them to be aware of how much they’re vaping and how they’re doing. It’s an important step in reducing their usage, which is what we hope they do. Do you worry this will encourage young people to smoke? We’re not because we haven’t seen teens or really young people in our customer base. Most of the people we see want to stop smoking or at least try something else. It doesn’t have the fun aspect that e-cigarettes or cigarettes have. From what we’ve seen, this is more of a way out of smoking than a way in. I wouldn’t have started this company if I thought it would be a way for people to start smoking. Do you use or have you used Smokio? I haven’t outside of minimal testing. I’m not a smoker and, like I said, I don’t see Smokio as a way in. My co-founder has used it. He’s an ex-smoker and he has managed to quit smoking using Smokio. Are there people that claim to have quit or reduced their nicotine habit as a result of Smokio? Yes, we do have examples. We don’t have numbers to share, but we know of people who have received help in quitting smoking through Smokio. The coaching and tracking of usage, it pushes people a bit further and helps a little more than some other vaporizers. And globally, but especially here in France, there is a shift from smoking to vaping and that is leading to more people quitting. With the app you really got behind the psychology behind quitting. How did you develop that piece to help people quit or at least cut down on the habit? We worked with a group of doctors in Paris who have been working on nicotine and tobacco usage for decades. They helped us design the mobile app with tools and tricks to guide people who use the app as a way to cut down on their smoking habit. Just to be clear, Smokio is not a smoking cessation device, it is not a medical product, and it is not FDA-regulated. It’s recreational, but we felt the “smart” aspect would help people in reducing or quitting. A big piece of quitting smoking is the financials. With the app, users can see how much money they are spending and if you see that day after day, week after week, it can give you a bit more willingness to stick to your plan of not getting back into smoking. Outside of sales, how will you know it is successful? If everyone uses it like you intend, they’ll quit smoking and you’ll be out of business. I would love that. There are 1 billion smokers in the world. If 1% of them uses Smokio and luckily manages to quit smoking, we’ll have already made plenty of money and we’ll be thrilled to have helped those people. Make sure you do your homework regarding nicotine. It is NOT a bad drug and has many useful medical qualities. The negative is, to those who ban and shun it, it looks like smoking and leads teens to the real thing. @Bonnie Thanks for your note. As nicotine is addictive to many, Smokio is designed to help users reduce its intake. It also is not available for sale to anyone under 18. This sound very interesting, I have been thinking about using this type of device to help me to quit smoking. Do you also sell the nicotine? Does the Smokio need anything special to operate? Does this vaporizor function just like the ones in the stores - minus the smart phone technology? What type of battery does it use? Rechargable? @pamela The E-Fluid to be used with this device will need to be purchased separately; it is not available though The Grommet. The Smokio kit includes: Smokio smart battery (650mAh), eVod2 tank, replacement coil, USB charger, and user manual. The battery mentioned above is a rechargeable lithium ion type, which recharges via USB. @Psmela - I quit smoking (a 23 year habit) by switching to e-cigs. If I were still smoking, I believe I would buy Smokio today, because of its technology and tracking. Seeing concrete numbers really affects the mind and psychology of the smoker. @Anthony Thank you for sharing this feedback with us. The Smokio does not come with E-Liquid, so the choice to use nicotine products or alternatives that do not contain nicotine is up to the end user. Since this is intended to be a quitting aid for smokers, nicotine free E-Fluid may not be sufficient to help currently active smokers reach their objectives. @Dan "Just to be clear, Smokio is not a smoking cessation device, it is not a medical product, and it is not FDA-regulated. It’s recreational, but we felt the “smart” aspect would help people in reducing or quitting." @Don (To clarify: Don in his comment directly above is referencing the maker's response to one of Mike's questions earlier in this thread). It is true that from a medical and regulatory standpoint this can not claim to be a "smoking cessation device". That said, the maker has stated that the motivation behind creating Smokio is to give current smokers a tool to access useful data about their habits and reduce their intake of harmful substances. The "vaper" I want to get this for does not own a smart phone. Will it still work? How? @cynthia Thanks for your note. In order to use the Smokio data tracking capabilities, the user would need to have an Apple or Android smartphone. Otherwise, the Smokio acts as a standard vaporizer. Smart and 'vaping'....two words that dont go together. I am disappointed you would carry a product like this. @Don We understand that today's Grommet is not appropriate for everyone. The decision to launch Smokio on our site was made with great care; we hope that members of our community who can benefit from the data monitoring capabilities built into this device will find it a useful alternative to more unhealthy options available elsewhere. I know so many people who have quit with E cigarettes. They are designed to help people get away from all the harmful smoke. Nicotine is NOT TOBACCO but a much safer habit. I don't like your marketing of this product. If it does not come with Nicotine , where would this be obtained? @Bob Hi Bob, Ryan from the Grommet Discovery team here. You are correct, it does not come with Nicontine. The e-liquid can be obtained anywhere they sell e-cigarette - local convenient stores, gas stations, and through online channels. Purchasing age will vary state to state. Please talk about the nicotine to be used with this product. There is concern about the quality of liquid nicotine. You must have given this some thought. Please share. @Ellen My understanding is that there is a wide variety of E-Liquid that can be used with Smokio. The device does not come with liquid, and is not designed for any specific blend, so we suggest that you consider the options available to you locally. It is always a good idea to read all labels carefully so you are aware of the ingredients and the concentration of nicotine in the E-Liquid you use. For most smokers, giving up cigarettes is tough. Many have turned to vaporizers because they simulate smoking without tobacco, tar, and carbon monoxide. The trouble is, they still contain nicotine and aren’t really designed to help you quit. But Smokio is a more thoughtful approach. Unlike basic vaporizers, Smokio is a smart vaping monitor that can empower you with data about your behavior. All the details about your habit are sent straight to your smartphone, where you set goals and watch your progress toward giving up nicotine all together. 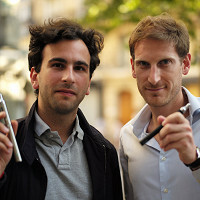 Founders Steve Anavi & Alexandre (Alex) Prot collaborated with Paris doctors who’ve been working on nicotine and tobacco usage for decades. They wanted to guide people to cut back by helping them visualize the benefits—including the significant savings. The Smokio app shows your savings adding up as you cut back. It shows how your health improves, too. 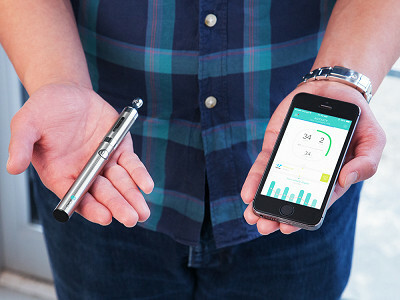 Each day, Smokio tracks the number of puffs taken and e-cigarettes smoked, and contrasts the total nicotine intake to that of regular cigarettes. Smokio also shows you the times and places you vape most often. For added support, connect to the Smokio community and even add sponsors to get encouragement.